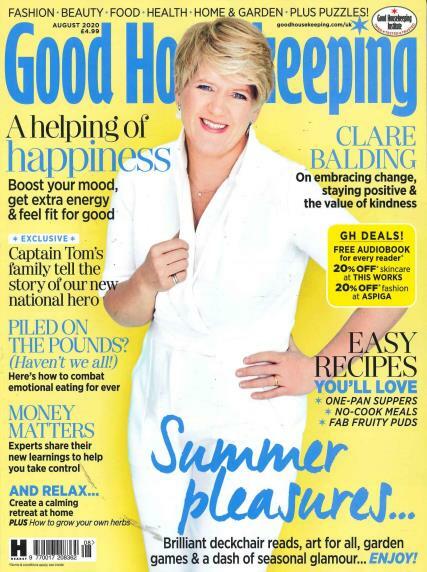 Good Housekeeping is one of the most comprehensive and popular publications for the home today. Buy a single copy or subscription to Good Housekeeping magazine. Full of real-life features, fashion advice, home ideas and more cooking tips than you can shake a ladle at, it is little wonder that Good Housekeeping has been so successful over the years. It takes a comprehensive look at everything the modern home and the modern family needs. From consumer advice on products and services to covering important issues and current affairs, The magazine has been appealing to a broad audience since its inception in 1922. Originally published in the United States, Good Housekeeping is now a monthly domestic bible across the globe. The heritage is one of proactivity. With an editorial team that has made its stance clear on everything from the quality of produce in cooking to its prohibition of cigarette advertising, the mag takes a firm line on issues it feels strongly about. As a benchmark for consumer products, the Good Housekeeping Seal of Approval is still a valued sign of genuine quality in domestic products today. To its readers, it is a trustworthy source of information and opinion on everything from mobile phones to moisturisers. It is a lovely publication with something for everyone. My two daughters and I love it. We like the different recipes, hints on making your home more beautiful and I love the Sandy Toksvig last page! My sister loves this mag! This was a gift and the recipient has said she is enjoying the first edition. I've been reading this for free in the local library, but found there are lots of articles & recipes I want to cut out and keep, so have treated myself to this subscription. Great, wish it was weekly. My favourite is Good Housekeeping - something for everyone and up to date fashion plus great cookery ideas. I read Good Housekeeping and it is invaluable in the reviews and recipes it produces plus all the latest fashions and trends , what more could you ask for. I love reading Good Housekeeping for the variety of subjects covered. I scan read it first to see what is on offer and special offers on items I may be interested in, then go back over and over reading the articles as time permits. A compelling read whether in a hurry or got time for a cuppa and a read. Love it.